I walked away from my first year back to AP Lit this year in many feeling a sense of accomplishment. Students seemed engaged. I loved hanging out with them every day. They learned some things. They worked hard. We laughed some. I miss them! But there are some key areas where I want to get better. Teaching is hard. Teaching reading and writing is hard. AP Lit teaching is hard. WORKSHOP teaching is hard. I have been actively working toward a workshop classroom since I first did the Colorado Writing Project summer workshop in 2009. Every year I get closer. But I’m still trying to get there. 1) Book Groups. I really want my students to develop reading practices that last for life. Book groups are things that humans sometimes do–I’ve been a part of several and they keep me reading. My favorite book group started this past January, though. Three of my AP students asked me and a colleague if we would be a part of their “third hour book club,” which we all had as an off period. I cannot tell you how awesome it was to meet with them on a Friday during third hour every few weeks or so to listen to them push and challenge each other about the books they had chosen to read. We read five. Five challenging books on top of their heavy course loads and busy lives. Every time I sat there with them talking about these books in a discussion space they had created themselves, I thought about how to replicate the same for my classes. 2) Independent reading. As I said above, there’s already an independent reading component to the course. I ask for 2-3 hours of reading per week with 30 minutes provided in class on Mondays. Their priorities for the reading are first, the books we’re reading for class, second, any book of equal literary merit, and third, any book they want to read. The choice is incredibly important, but I want to put more options in front of them for the choice bit. A colleague and I are working on a list of contemporary authors who are writing complex and wonderful and brave and important works of literature. I’m talking Jesmyn Ward, Paul Beatty, George Saunders, Mohsin Hamid (to name a few). (The Man Booker award winners and shortlist nominees has become a go-to for me in my own personal reading of late). These are books that show students that literature can make powerful statements on our current world. You may be thinking that a decent classroom library is what I need for this. And you’re right. But there’s a critical problem with this in our school: 17 language arts teachers share 10 classrooms. We cannot count on the same classroom from year to year, and we cannot count on teaching all of our classes in one classroom in a given year. Last year I had all of my academic classes in the same space. Next year, they’ll be spread between three classrooms. This makes the logistics of building a classroom library over time difficult. But we do have a fantastic library in our school with a great fiction collection. The librarian is always happy to order more books for us too. I will remain anchored on choice for the independent reading requirement in my classroom, but I will put some options in front of students that will show them the powerful literature being written in our world right now for that reading priority #2, books of literary merit equal to the books required for the course. 3) Disruption. If you’ve not had a chance to check out any of the #DisruptTexts conversation on Twitter, head over there right now to see the recent conversation on The Great Gatsby. I sent the conversation to my two colleagues who also teach AP Lit and had some conversation about it at our planning meeting a couple of weeks ago. I think that the conversation surrounding disrupting texts is so critically important. Gatsby is on my syllabus. But I want my students to interrogate it (and all of our books) so much more. My writer’s notebook notes on our recent AP Lit team planning meeting, thinking about next year. I wrote this down after I explained to my colleagues how I wanted to use disruption as a framework to organize my entire class next year. The first one: How were authors working to disrupt their world? Here are the additional questions I’ll throw at my students: What problem might the author have been addressing with the book? How do you know? How successful was the text as a disruptor? Where did it fall short? The second one: How can we as readers disrupt the text? I already give my students a list of questions from different critical perspectives. But I think that working under the frame of disruption will encourage students to draw on some of the questions more meaningfully. A feminist reading of Gatsby is important, for example. And I will ask my students to disrupt the list of questions too–which questions aren’t there that should be? In short, I want to cultivate more critical readers. I want them to be looking carefully at humans are portrayed in texts, whose stories are missing, how that affects the success of the work. The third one: What about our world you do you want to disrupt? And how will you accomplish this through words? My class ended on the Semester Long Piece of Writing this year, which was essentially a multi-genre paper using our books to answer the question, “What Does it Mean to be Human?” (more about this in my post in this series about sharing the feedback load). I think I’ll use the multigenre paper again but this time using a different question, one about disruption. This would put students in the role of author looking to use words imaginatively and artistically to disrupt the way society deals with something in our world, and the books and poetry they read for the course will be their mentor texts. I can’t wait to see what they do with this. It’s been a furniture problem in the past. The student desks are so difficult to move around–heavy, awkward. It’s just easier to set them up and leave them as they are. Our entire school district is in the middle of a multi-year bond construction project, and construction just started this spring at my school. 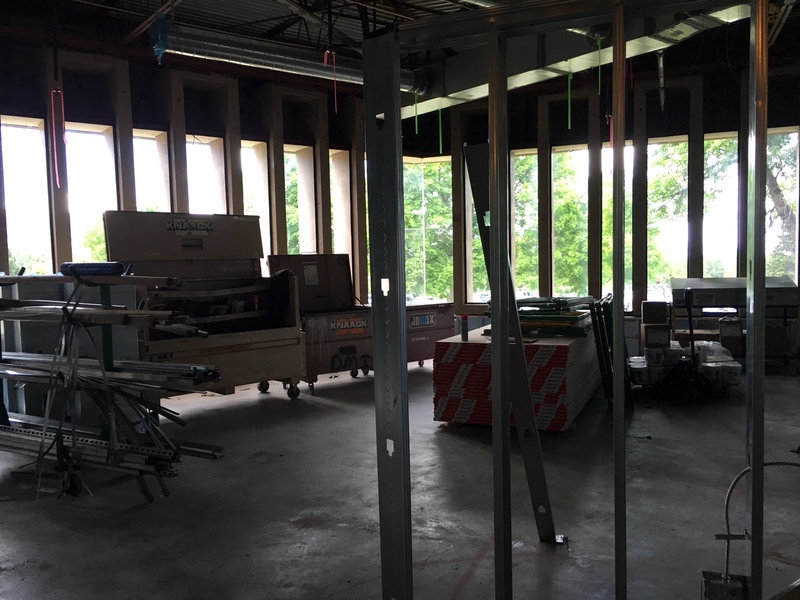 The language arts department is being relocated in the school, including six brand new classrooms in what up until now has been the school’s cafeteria. I took the photo during finals week. I was wearing a hard hat because it’s a construction zone. The windows are more exciting than you can realize–as I’ve not taught in a room with windows for several years now. But what also comes with this new classroom is some flexible, easy-to-move furniture that should facilitate the flexible grouping I imagine. 5) More poetry. We had some great poetry weeks this past year, and I want to make more space for it. I invited groups of students to bring three poems (thematically related) to the class for some reading, discussion, and analysis. Two poems had to come from the list of poets recommended by the College Board and the third could be anything they thought was worthy of our time. We looked at Kendrick Lamar. We looked at Father John Misty. We looked at some powerful spoken word poets. I just want to do more of this. And I want them to write some poetry too–maybe that can be my first semester final task. An original poem that works to deliberately disrupt something about society. They could read it to the class or we could make an anthology. Then they could use the poem in their multigenre paper for second semester’s final task. All I know is that at AP training last summer, our instructor told us that the poetry free response question on the AP exam is always the one students struggle with the most. More practice (reading AND writing poetry) will only help. 6) More conferences. In my classroom workshop, this is probably what I struggle with most. Making time for them. Figuring out the best way to collect my notes on them. Making conferences a key component of the course. In my other senior language arts course that I teach, I’m much more consistent with writing conferences. Students have about two class periods to write each week, and while they do this, I circulate and have conference conversations with them. In AP Lit, most of the in-class writing time is filled with the timed writes that we all do together. If I’m writing with them, there’s no time for conferences on those days. And reading conferences: I am still figuring this out in both of my language arts classes. I know I need to get more systematic and intentional about them, and I need to be more consistent in recording my notes in a way that is most useful for planning instruction. If you’ve got ideas for this, I’m listening! Where do you want to improve your AP Lit class? What ideas do you have for me on any of the areas I want to make better? This entry was posted in #WorkshopWorksForAP, AP Lit, blog series, conferring, making change, planning, reflections, summer 2018 blog series, teaching literature, teaching reading, teaching writing, workshop teaching. Bookmark the permalink.